Some books exposing the underbelly of life are cathartic. This one was not. It was like opening a rift in the earth, letting out the magma. A nonfiction, it is about two friends, me and an ex-cop joining each other for an expedition across a treacherous part of the Navajo reservation. Jacket text: Craig Childs is lost. In a labyrinth of canyons in the American Southwest where virtually nothing else is alive - barely any vegetation, few signs of wildlife, scant trace of any human precursors in this landscape - Childs and his friend Dirk undertake a fortnight's journey. With as much food and gear as they can carry, and little else but their wiles to help them traverse the inhospitable, unmappable terrain, the two men assume the life-or-death challenge of exploring this land - and then finding a way out. Equally gripping as their adventure in the wild is the parallel story, told in flashback, of what has propelled the two men into these extreme circumstances. In scenes that crackle with tension and suspense - recollections of barroom brawls, high-speed car chases and reckless feats of risk- taking - we discover the surprising legacy of violence that each man is escaping. 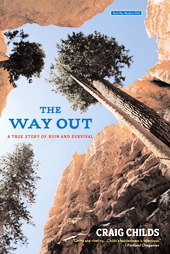 As a chronicle of adventure, as emotionally-charged human drama, as confessional memoir, THE WAY OUT is a transcendent book, a work destined to earn a lasting place in the literature of extremes.